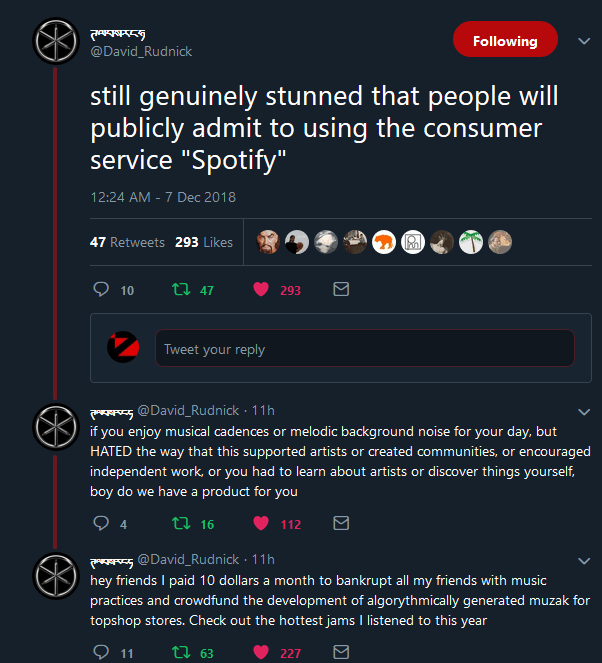 After seeing some people proudly posting how many hours they spent using the platform, I will speak about the reasons why I deleted my Spotify account. Spotify had revenue of a billion euros ($1.24 billion) in its third-quarter (2018), putting it on track for a full year revenue of more than 4 billion euros ($4.95 billion) and they almost pay nothing to the alternative artist or those who are not on a music Label. Spotify pays about $0.006 to $0.0084 per stream to the holder of music rights. Spotify algorithms are just another way to limit your freedom and somehow to scam to yourself, without actually realizing about it. You think that you “discover” new music, but you just eat what Spotify wants. The resume could be that on Spotify only “big fishes” are making revenue from an already bankrupted service. If you want to find new music, new artist and if you want to support them directly, without any scam intermediary, there is a place for that. It is called Bandcamp and there is no reason for not using it. You can download and stream the music and the money goes directly to the artist, with a reasonable fee for Bandcamp. And no, I don’t work for Bandcamp. And yes, you are free to do whatever you want. I just wanted to show my reasons. If you are supporting the problem, you are part of the problem.